As today’s kitchens are increasingly getting larger in square footage, the idea of adding a second island rather than one single countertop island is becoming more popular. Two islands in an expansive kitchen allow for better flow, functionality, and efficiency. Each island should have a specific purpose. For instance, one island could be solely devoted to preparation while the other could be used more as a breakfast bar or eat-in kitchen option. 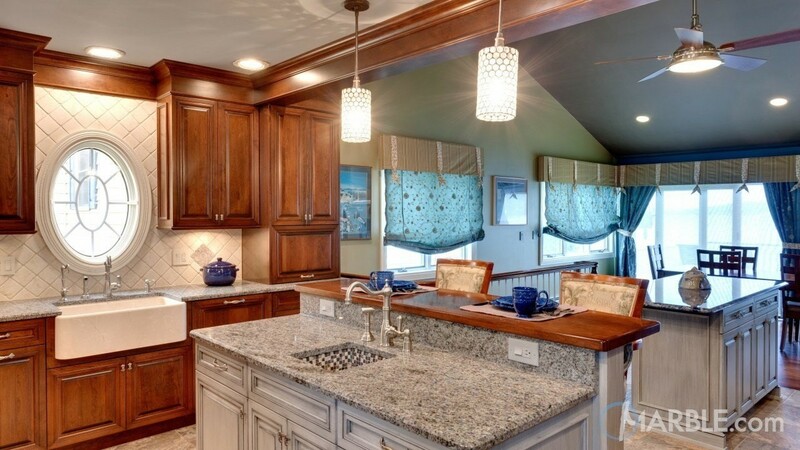 Ideally, an island for preparation should have a sink and possibly even a cutting board insert. Adding two islands instead of one allows for a better overall flow in a kitchen and greatly improves the efficiency of a busy cook. Simply put, it increases order within the kitchen. We source all types of countertops from marble, granite, quartz, soapstone limestone, and slate and often see designers mixing materials. You might have a marble baking area while the rest of the kitchen would be quartz or granite. Adding two stones within a kitchen creates a wonderful feeling of depth and complexity of design. As always, we recommend taking sufficient time to select the right stone. 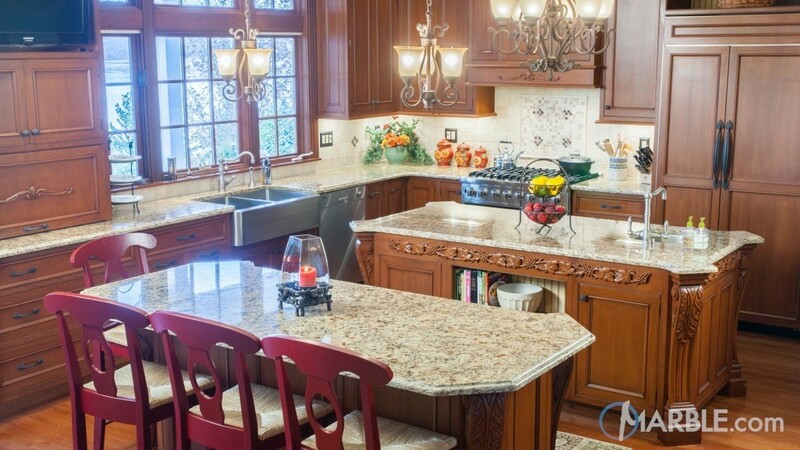 You might want to review this article I wrote recently about the different types of stones available for your kitchen countertops or kitchen islands. Each type of stone requires a specific maintenance routine, has a different texture, softness, and hardness. So, one stone may be appropriate for kitchen countertops, while another might be more suitable for your bathroom vanity top. You may think that two islands would only work in a large, expansive kitchen, but they actually work incredibly well in smaller kitchens. They increase the overall counter space and workspace while providing a better flow in and around the kitchen. These islands can house appliances like microwaves or toasters and clear off the actual counter space for preparation. A long and narrow kitchen would be overwhelmed by one island, but two islands will only increase the functionality of the space. 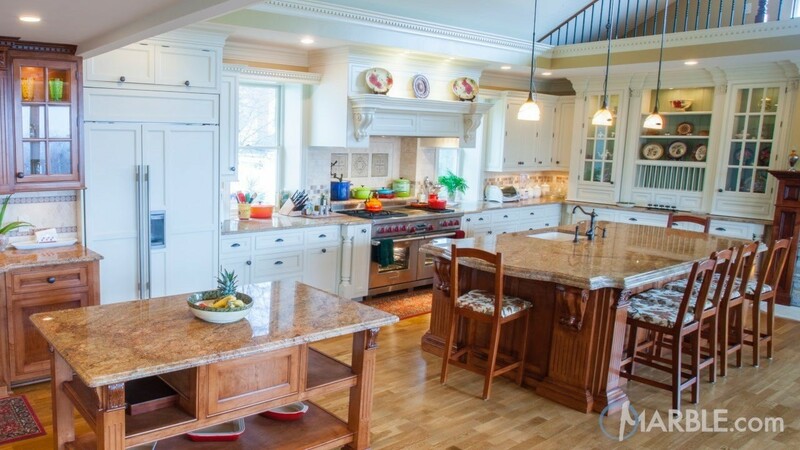 Many homeowners do prefer a single island because it provides a clean and expansive area to serve food or beverages. Another alternative to the single island is a two-tiered island. By adding a higher level to use as a breakfast bar with stools, you can separate your guests from the actual preparation of food. Whether you decide to go with marble, granite, or quartz countertops, adding two countertops to your kitchen floor plan will not likely be one you will regret.